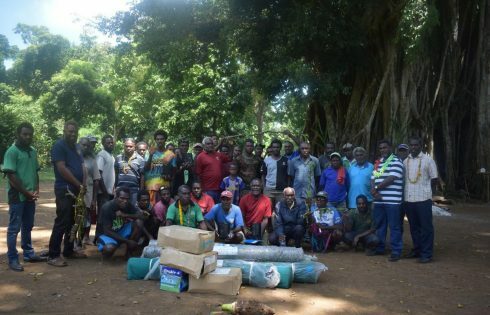 Over 400 kava farmers from South Tanna have shown interest in planting more kava, as a result of road development in the Southern part of the island. This was revealed during the handing over of project materials to create kava nurseries. With the initiative of growing more kava in South Tanna, the Government through the Department of Agriculture and Rural Development (DARD), has stepped in to support the farmers by donating 10,000 poly bags, four rolls of large green nets and two rolls of fence wire to start kava nurseries. This also includes 250 posters and awareness information materials on the noble kava varieties. The farmers are led by Walter Kota, chairman of South Tanna Kava Farmers Association. “If the government is investing huge amount of money in improving roads in South Tanna, there should be development as well,” said chairman Kota. The kava nurseries will be in the areas of Tan Asul and Nepraintata. The chairman said many people in South Tanna have shown interest in planting kava. “The materials will be distributed to two areas, as identified. Half of the materials will go to South West and the rest will go to South East,” he said. Mr Kota said the kava nursery project will be implemented as planned and he encourages kava farmers to continue to plant more kava. When handing over the project materials to the chairman of South Tanna Kava Association, MP Johnny Koanapo, revealed the good news about the second phase of the South Tanna road. “I have the privilege to inform you all at this historical place of Green Point on behalf of the government, that the government through the Prime Minister has signed the second phase of the South Tanna road,” he said. Mr Koanapo continued that the works on the second phase will begin within a month. Speaking on behalf of the Director of Agriculture Department, Principal Agriculture Officer South, Peter Iesul, said “the main role of the department is to increase kava production through its kava programme by assisting local farmers through Farmers Associations, to ensure that people involved in Agriculture increase production of kava”.